This golden retriever lead an ambulance through a maze of streets to save his owner who had collapsed in an alleyway. Sometimes we need a break from the craziness of the world and we just want to know what’s good. Chinese emergency services received a call about a garbage man who had collapsed in a residential alleyway in the Shanxi Province. The man was collecting bottles at a neighbor’s home when he suddenly collapsed on the ground in the narrow alleyway. While the ambulance was heading to the scene, they encountered the man’s dog, who was out looking for help. 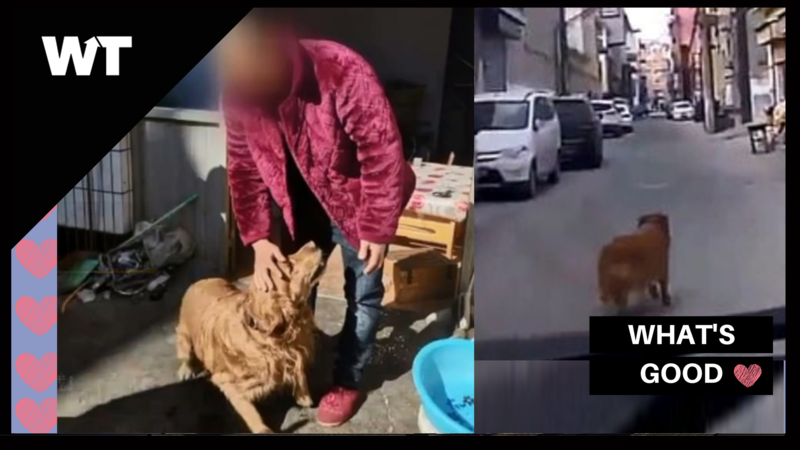 The dashcam footage shows the dog waiting for the ambulance in the middle of the road and beginning to run, prompting rescuers to follow it. One of the rescuers said that the dog kept looking back at the ambulance to make sure that the ambulance was following. The dog led them to a crowd surrounding the unconscious owner, who was then taken to the hospital for treatment. The owner’s son is currently taking care of his father. What do you think about this sweet story? Let us know in the comments or on Twitter at @WhatsTrending.